The title of this entry pretty much sums up my thoughts right now….OUCH! I just finished run #2 in my new shoes after 3 days off from the first run (and looking like perhaps another 2-3 days until my next). I went about 2 miles with a break in between mile 1 and 2 to stop at my gym to do some upper body lifting. Getting back into the run after lifting was tough. My calves were (and still are) so tight and sore I would let out an audible grunt each time I went from a walk to a run. I think I also probably looked like a person trying to run in diving flippers because that was my basic form for about 5 strides until my calves would settle down a bit. What is different in this run vs. my previous runs is that it was the pain that kept me from running – not being out of breath which is more often the case. So I know that it is just the adjustment to this new running style – firming up muscles that have been long under used. I do have to say that I am still not comfortable in the new style. I fee awkward and a little clumsy and of course there is the pain. But I will defeat this pain and (hopefully) become a runner with more endurance. I have decided that I will begin training for a race in October. It is actually a 4 mile trail run so I will need to get out to some trails when I have overcome this initial leg pain from the shoes to practice running through trails again (it’s been a LONG time since Jr. High cross-country!). But it looks like a fun little run through a local park…plus it is a run/walk so for me win/win. So for the past few years I have attempted to become a runner. As a kid I ran a lot, as a teen I was in cross-country and track. Then I quit my junior year and did not run consistently until about 6-7 years ago. Even then, I only ran in the summers and the consistency was….well….inconsistent. This year I have tried again to be a more consistent runner again purchasing a gym membership so that I can run indoors during the winter(basically forcing myself with the knowledge that I have invested money into this now). I actually enjoy running most of the time. As expected starting out is usually tough, I get frustrated with how low my endurance is and the sore muscles…but that does go away after a while. I just have to stick with it. Last week I began reading a book called “Born to Run” by Christopher McDougall. The basic thesis of this book is that humans are designed to run, but modern running footwear has destroyed our ability to run without injury or pain and creating the myth that the human body was never meant to run. He talks about a native tribe in Mexico called the Tarahumara who all run extreme long distances (we’re talking longer than marathons) with primitive sandals and no formal training regimen. If modern running shoes are the key to proper running, how could this tribe of people run 100 miles in leather sandals with no support? He argues that people should shed their bulky running shoes with orthotic supports for minimalist shoes or even no shoes and he has data to back this up. There appears to be physiological data to suggest that the human foot is elegently engineered to run, WITHOUT shoes! So he has sold me, I bought a pair of minimalist shoes and went for my first run in my new shoes yesterday. Here is a picture of the shoes – in chili pepper red of course! Now leading up to this, I have been in conversations with a friend of mine about what proper running form should be. One should not ‘heel strike’ but should instead fall on the balls of the feet when running. I have been adjusting my foot strike for about 6 months now, but in my old running shoes. It took a little discipline because typical running shoes make it very difficult NOT to heel strike. But I did it. Yesterday in my new shoes it was almost impossible TO heel strike! The first few strides felt very different from what I was used to. It felt more natural to strike mid-foot with shorter strides. It felt great…for about a half mile. Then my lower calves began to burn. I knew this would happen though. Because modern running shoes have so much support, you actually use fewer muscles in your foot and calves causing them to become more weak. 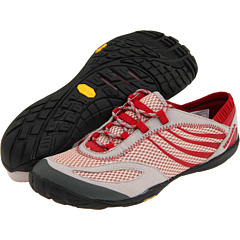 Minimalist running shoes with no support (they feel like I’m wearing swimming shoes) force you to use these weakened muscles. It will take a couple of weeks for my body to adjust, but I am excited to see if I see the results that McDougall describes in his book – less injury, more endurance, a bigger passion for getting out and running. So as an update, I ran a little over one mile yesterday in more pain than when I have run 3 miles in my old shoes recently. I plan to keep it up in the new shoes and am excited to see what the outcome might be. I was VERY sore yesterday right after my run and thought I would be walking around like an old woman today…but am actually not that sore which is a nice surprise. I do recommend the book “Born to Run.” Even if you are not a runner or do not wish to become a runner, it is a fascinating story about people who run incredible distances (100 miles!) and gives a solid and strong argument for human beings being natural runners. I’ll keep posting about my progress with the new shoes and new running style (it really is quite different from running in my old shoes). 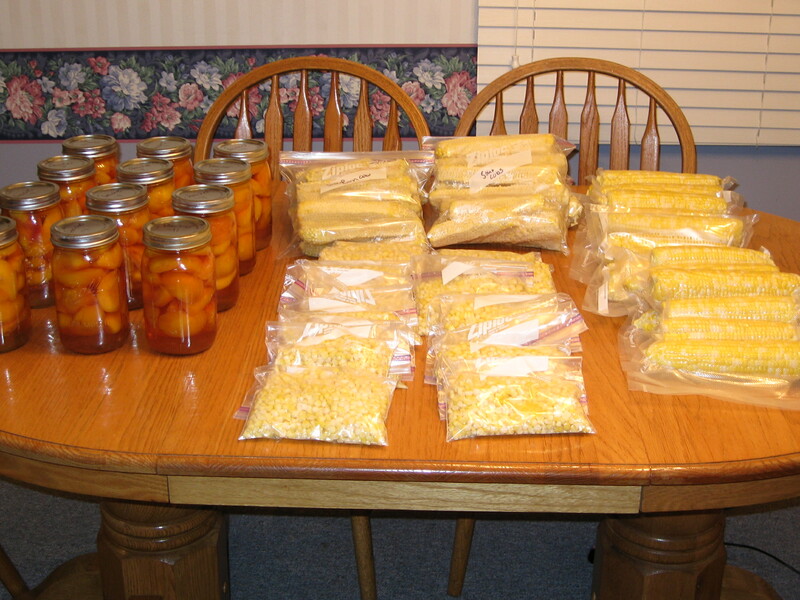 What you see here (from left to right) are 12 quarts of peaches in light syrup, 4 dozen ears of corn cut off the cob (the cut cobs are behind the bags of corn for later use in soup stock) and 2 dozen cobs to be frozen on the cob. 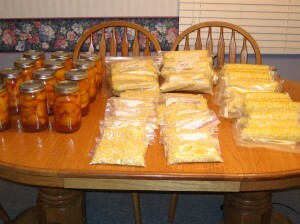 As you can likely tell by the fact that I kept, and will freeze, the spent cobs, I like to use all part of food. All of the husks are now in my compost heap for use later in the garden. As I was husking the corn I was thinking about how I do these things mostly as a hobby. I enjoy food…growing, preparing it, eating it. But all of the things that I do are not necessary in today’s food economy. I could spend much less time and just buy this stuff from the grocery store. But instead I will spend months of work and worry on growing vegetables and hours of time preserving food FOR FUN! Not that long ago, people had to do this to feed themselves during the winter months. I have other hobbies that were once a necessity as well including knitting and crocheting. I started to wonder if there would be any activities today that are living necessities that would become the hobby of some person in the future. Perhaps driving your own car? Cleaning your own home? Writing using a pen and paper? I’m really not sure. We have so many conveniences today that it is hard to think of things that are living necessities that one would only do as a hobby in the future. Doing that activities of canning and freezing today also had me thinking about what those people of the past would think about a person who chooses to engage in this time consuming activity? The reasons that I do it are partially for the enjoyment of the process…but let’s be honest, that process gets old quickly. The bigger reasons are a satisfaction of making something myself from nearly nothing (in the case of gardening), and being able to enjoy something that I made months after the garden has been put to bed. I find a much closer connection to my food because of this. I have spent so much time and effort that I take the time to use the preserved food in the beat meals and I take the time to really taste the food that I have made. I think that this focus on food has waned in our country. Instead we tend to focus more on what is quickest to heat up and shove in our mouth. Much of this commercially prepared food I find less tasty and fulfilling (note I did not say filling!). So any thoughts on which of today’s necessary activities will become a hobby of a future person? No this is not a Sam Adams commercial…though I do like the philosophy of the breweries with seasonal beers (ones that are truly seasonal and have beers that are simply not available out of season). My husband and I are avid gardeners and anyone who has had a vegetable garden knows that this is the time of year that the real harvests begin. Zucchini, tomatoes, cucumbers, corn, onion, you name it – it is probably coming ready soon. What this also means for the avid gardener is that you have much more fresh veggies ready that you could possibly eat right now. Some people like to simply give away their crop, I have to admit I’m actually rather selfish with my produce. It is this time of year that I spend hours canning and freezing the veggies that my little family will eat through the rest of the year. Currently I have canned several quarts of peaches, frozen many cups of shredded zucchini, and just completed 5 quarts of dill pickles. This is just the beginning. Later this week I will be canning tomatoes (not sure yet if simply canned tomatoes or if I will make salsa), and freezing corn. So my rhythm during this time of year is focused on food. Honestly, it’s fun for a while…then it can become a bit of a pain. But the real satisfaction comes in mid January or February when we can still enjoy our own fresh tomatoes! Totally worth the time and energy that it takes to preserve your own food! Soon enough our garden will be spent, we’ll tear out the old plants and put it to sleep. By that time we will be ready to be done with our garden for the year – it takes a lot of time and energy to weed, garden, tend, worry, etc. But sometime during the winter, Caleb and I will begin dreaming again about what we will plant, when we will start, what we need to do to prep the garden soil. Then spring will come and we’ll have the excitement of buying our plants and seeds and then planting everything and watching it grow and waiting for the fruit.